Cue the confetti!! 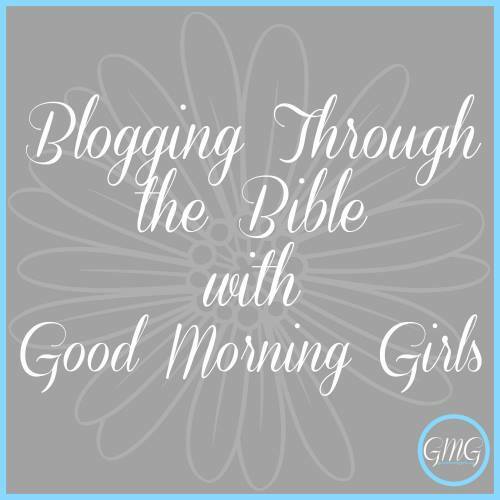 Today we are finishing up Proverbs 31 and completing our Proverbs Summer Bible Study with the Good Morning Girls! We are studying Proverbs 31:27-31 today. We find in the last part of verse 30 the one key needed in how to become a Proverbs 31 woman. Let's read our portion of Proverbs 31 for our final day in Proverbs. What a journey it has been to look into the heart of the Proverbs 31 woman! This is my second time studying the Proverbs 31 woman, and once again, she has been such an inspiration to me. Her wholehearted obedience to God - her fear of the Lord - is the root of all the character qualities we have witnessed in her life. It's our fear of the Lord and our wholehearted obedience to Him that will help us to become a Proverbs 31 woman. This is a woman who never gives up in walking on the path of wisdom that we find in Proverbs. Her diligence has been witnessed in every part of her life - with her husband, with her children, with her servants and with the poor as she meets the needs of those God has placed in her life. One very important point we need to remember is that she didn't become the woman we are reading about overnight. This was a lifetime journey for her, as it will be for you and me. We must not look at the Proverbs 31 woman and become discontent with our lives or with who we are at this particular point in time. What we need to do is take all of these lessons we have learned from her life and one by one work to apply them to our life so that each characteristic becomes a part of who we are and a way of life for us. This will require time. It will require more studies into the life of the Proverbs 31 woman. We will learn something new each time that we study her life which we can work to apply to our life. It's a worthwhile, lifelong journey. Friends, our wholehearted obedience to God - like that of the Proverbs 31 woman - begins in our hearts. As we daily submit our heart and our will to line up with the will of God, we can begin to develop these characteristics that we've seen in the Proverbs 31 woman. Then we will enjoy our own fruit from the work of our hands. Then we will receive the praises of our loved ones. Most importantly, we will be pleasing God through our acts of obedience as we seek to live our lives according to His will. I just want to say thank you to everyone who has been here with me on this journey through Proverbs! Thank you for your kind and thoughtful comments. It was so nice to know that you were here with me these past 7 weeks that I've blogged through the book of Proverbs. 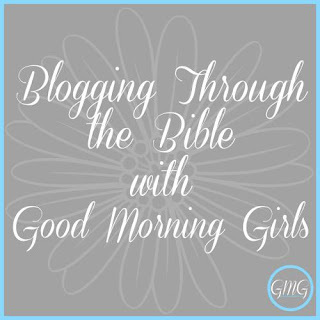 Monday we will begin reading in Song of Solomon with the Good Morning Girls. I will not be blogging every day as we read this book of the Bible. I'm sure you can understand that I need a bit of a break...lol...so I'll just be posting about Song of Solomon once, maybe twice, per week. I hope you will join me again as we continue reading through the Bible. 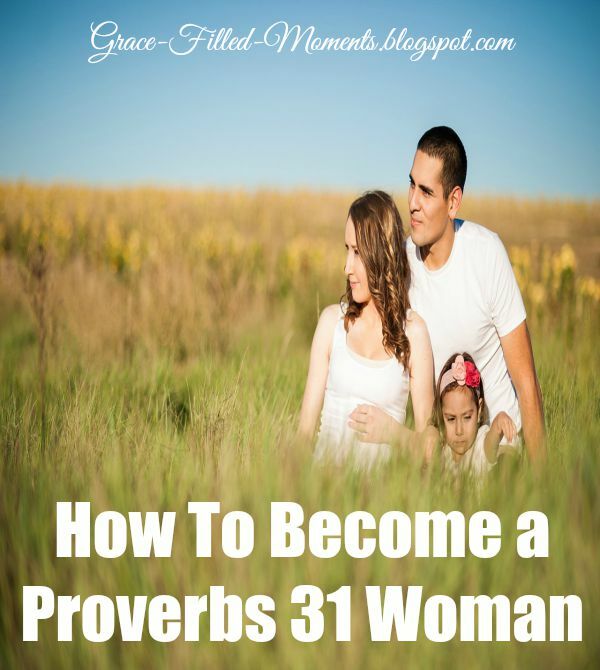 Laurie, I just discovered your blog on the last entry of your Proverbs 31 study. How wonderful that you go through a book of the Bible! I remember hearing a speaker during a women's retreat talk about the Proverbs 31 woman, and she said something interesting, she equated the Proverbs 31 woman to Mary (of Martha and Mary) and her focus, like your insights recorded in this blog post, was that Mary's heart, at the feet of Jesus, would naturally outflow into Martha activity. I never thought about the Proverbs 31 woman as becoming like that over time, but you are absolutely right! As we seek Jesus, the mind of Christ will rule our hearts. Welcome, Karen! I love what you shared with me about the women's retreat speaker! That's it exactly! Hi Laurie, it's great to meet up with other God fearing mothers and bloggers like yourself. I followed you on Pinterest and I look forward to networking with you. Welcome, Minnie! So glad to meet you too! Thanks for stopping by. I look forward to networking with you too! That's right "The Forever Joyful Homeschool"..we should be speaking positively too about our children and husband in public. Thanks for sharing! Where is Your Strength Found?